November soybeans closed at USD9.82 ¼, up 18 ½ cents, December soymeal at USD391.00, up USD11.90, and December soy oil futures at 38.37 cents, unchanged. Trade estimates for tomorrow's export sales range from 550,000 to 700,000 MT. Last week's sales were 524,900 MT. The soybean harvest is wrapping up for most farmers but lots of corn is still left. Argentine weather looks to be a concern, especially in the west of the country. December corn futures closed at USD3.90 ½, down 3 ½ cents, March corn futures at USD4.05 ¾, down 3 ½ cents. Analyst estimates for Friday's corn export sales range from 450,000 to 650,000 MT. Last week's sales were 571,200 MT. China's CNGOIC held their forecast for this season's corn crop unchanged at 163 MMT, despite just about everybody else coming in at 145-155 MMT. US weather is seen turning unfavourable again in the heart of the Midwest Corn Belt beginning Saturday and continuing through Monday, says Gail Martell of Martell Crop Projections. December wheat futures closed at USD5.31 ¾, unchanged. Egypt bought 295,000 MT of wheat from their favourite low-priced supplier, Russia. The grain harvest in Western Australia is off to a slow start hampered by rain. Farmer selling remains light due to unfavourable prices, accentuated by the strong Ozzie dollar. Argentine wheat might have suffered some damage from a recent frost, sources suggest. EU wheat closed mixed with London November feed wheat ending down GBP0.35/tonne at GBP104.90/tonne, and Paris January milling wheat up EUR0.75 at EUR131.75/tonne. Egypt bought 295,000 MT of Russian wheat in it's tender today, that shouldn't really have surprised anybody too much, but it seems like it did. It's back to business as usual it seems. "Oh look, a large suitcase stuffed with money, condoms, champagne and and a naked dancing girl seems to have inadvertently fallen into my lap. I'll take that down to the police station first thing in the morning, there's no point rushing down there right now, it'll be shut," said nobody to do with anything. That leaves Europe and the US fighting over, shall we say, more discerning buyers. Unfortunately they are few and far between at the moment. 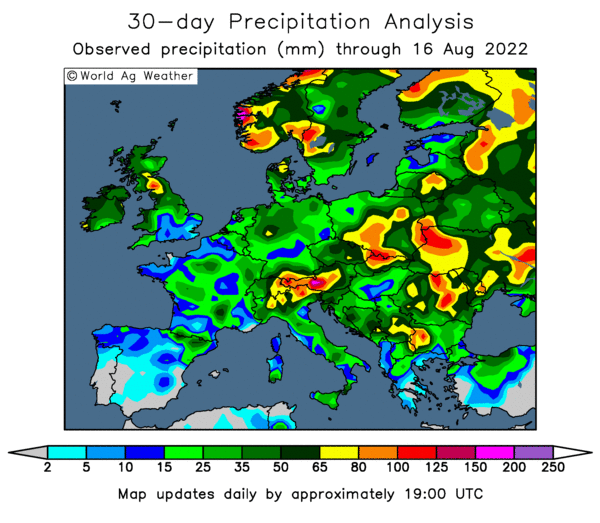 French analysts Strategie Grains say that cereal plantings in the EU-27 will fall by more than a million hectares to 56.97 million ha for the 2010 harvest. The soft wheat area will however increase by 1% to 22.86 million hectares, they say. The grain harvest in Western Australia is off to a slow start hampered by rain. Farmer selling remains light due to unfavourable prices, accentuated by the strong Ozzie dollar. Argentine wheat might have suffered some damage from a recent frost, sources suggest. The overnight grains closed with beans, corn and wheat all around 8 cents easier - when was the last time that that happened?? Crude looked like it might have been attempting to break and hold above USD80/barrel yesterday, but failed and has subsequently slipped back to USD78.60/barrel. Yesterday's normal stocks data from the US Energy Dept. appear to have been delayed until today, a one million barrel increase in inventories is what the market expects. Gold has hit fresh all-time highs again, the dollar is a bit stronger for a change and the Dow is expected to open lower after hitting 13-month highs yesterday. Chinese soybean imports are picking up again. After dropping to 2.5 MMT in October, they will import 3.5 MMT this month, rising to 4 MMT in Dec and Jan, say CNGOIC. They also held their forecast for this season's corn crop unchanged at 163 MMT, despite just about everybody else coming in at 145-155 MMT. 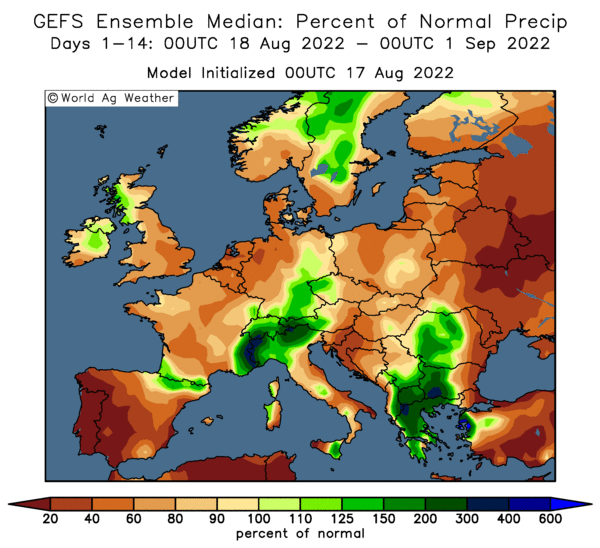 On the weather front, the latest GFS model run looks wetter and more threatening for harvesting delays in the heart of the Midwest Corn Belt beginning Saturday and continuing through Monday, says Gail Martell of Martell Crop Projections. Attention is already starting to focus on South America, where essentially parts of Brazil are too wet, and the western half of Argentina is too dry. Egypt are tendering for wheat, it's unlikely that the dollar has fallen enough for US origin to win but you never know. Early calls for this afternoon's CBOT session: corn down 6-8, beans down 7-9, wht down 6-8. Unless the funds are willing to come in and push it some more, feel that we might see the board ultimately close sharply lower tonight. Basis FOB Hamburg/Lower Rhine in euros/tonne. 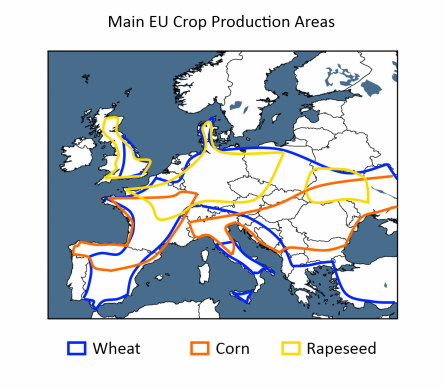 French analysts Strategie Grains say that cereal plantings in the EU-27 will fall by more than a million hectares to 56.97 million ha for the 2010 harvest. That's a fall of around 1.8%, only that little (?) I hear you say. That's right folks, barley plantings will unsurprisingly see the sharpest decline, down (a not too whopping) 6% to 13.09 million hectares, they say. Meanwhile they are actually forecasting an increase in soft wheat area, up 1% to 22.86 million hectares. Oilseed plantings will rise, particularly OSR sowings up by 6% to 6.8 million hectares, they say. An additional 300,000 hectares will go into set-aside say our garlic-munching chums. They also dropped their corn production estimate for this current season by almost three quarters of a million tonnes to 56.21 MMT. That hardly inspires confidence in next season's predictions if you ask me if they are still struggling to get 2009 right. The pound is under pressure again after BoE governor Meryn King's comments yesterday that a weak sterling was good for the economy. Merv even went a stage further by saying that he was open to more QE if necessary. Considering that Fitch ratings said earlier in the week than any further significant extension of the stimulus package might put Britain's AAA credit rating at risk, that certainly explains some of the current weakness. The dollar isn't much better however. The Dow closed at a 13-month high last nigher after the Fed suggested that low interest rates are there for some time yet. December gold is still on the up this morning, reaching a contract high of more than $1,122 an ounce. Oil World says that the approval by the EU recently of three varieties of GMO corn, in an effort to allow imports of US soybean meal to resume, is unlikely to lead to a large-scale resumption of supplies until a fourth GMO maize type MIR604 from Swiss group Syngenta is also approved. Indian wheat futures are back on the up, rebounding from losses earlier in the week after the government suggested that they would finally release some wheat to local millers ate below market prices. Once again the government have so far failed to deliver on their promise, despite food inflation edging up to 13.68 per cent for the week ended October 31, from 13.39 per cent in the previous week. Whilst rains have brought some relief to the eastern half of the Argentine grain belt, a drought about to enter it's second year still grips the west of the region. "In early November drought was considered serious (grave) in Central Cordoba and western Buenos Aires, key growing areas for corn and soybeans," says Gail Martell of Martell Crop Projections. "The November 11-17 rainfall forecast calls for the same anomalous weather pattern to persist, wet in South Brazil and dry in Argentina's southwestern grain belt," she adds. Read her full story here, which highlights the problem areas, and compare that to the major soybean growing regions here. The drought has intensified during the past few weeks, preventing timely plantings and creating unfavourable conditions for germination, say Oil World. "There is a high risk that the required rainfall does not occur everywhere before the planting window closes. Argentine crop losses could be extreme if the situation does not improve within the next 3-6 weeks," they said. Oil World recently cut their estimate for Argy soybean production in 2010 to 50 MMT from 52 MMT adding that seed quality "could become a serious problem, reducing yields below potential." US officials in Buenos Aires last month also warned that so-called "brown bag" seeds – those saved by farmers from harvest as is common practice in Argentina – would "likely have lower germination rates". Funnily enough this time last year we were also expecting an Argy soybean crop of 50 MMT, before the drought ultimately wiped 18 MMT off the board, and also badly affected soybean quality. November soybean futures closed at USD9.63 ¾, up 2 ¼ cents, December soymeal futures at USD289.10, up 0.90 points and December soy oil futures at 38.37, cents, up 0.81 points. The lower US Dollar earlier stimulated some buying interest in the soybeans and then the Dollar rallied limiting the up move. There are some weather concerns emerging from South America already, especially in parts of Argentina, which has been under the grip of drought for nigh on two years now. December corn futures finished USD3.94, down ½ cent, and March corn futures at USD4.09 ¼, up ¼ cent, with much of the market action connected to fund trading. The US harvest continues to lag, and after a week to ten days of opportunity forecasters are now calling for that window to be slammed shut next week as widespread rains return to the Midwest. December wheat futures closed at USD5.31 ¾, up 8 ¾ cents. A fresh influx of fund money pushed wheat higher despite bearish fundamentals, traders said. US exports continue to lag, although Japan is shopping for 97,000 MT of mostly US wheat this week and Jordan are in the market for 100,000 MT later in the month. Egypt is also tendering for wheat this week, although US origin has been out of favour recently, a weak dollar may help. EU wheat futures continued to confound the bears ending slightly higher Wednesday with London November feed wheat up GBP0.40/tonne at GBP105.25/tonne, and Paris January milling wheat EUR1.50 at EUR131.00/tonne. EU markets basically followed US futures higher despite a weak dollar further knocking the competitiveness of European grain. A weak sterling helped London wheat somewhat however, following comments from Bank of England governor Mervyn King that a weak sterling would help the UK economy. His comments come just over 24 hours after Fitch Ratings warned that the UK was the most likely of the G10 nations to lose it's AAA sovereign credit rating. Fund money seems to be flowing back into US commodities, pushing prices higher despite them being in the midst of corn and soybean harvesting. Data from the USDA yesterday seems to confirm that production losses have so far been minimal, despite a wet finish to their season. The Russian grain harvest now stands at 101.4 MMT in bunker weight, according to the Ag Ministry, of that 63.4 MMT is wheat and 18.7 MMT barley. That is only marginally down on last season, and significantly higher than summer estimates. Egypt are back in the market tendering for two cargoes of wheat, last week's order was split 50:50 between Russian and French origin grain. Jordan are also shopping for 100,000 MT of wheat. The overnight grains closed firmer, with beans and wheat around 6 cents higher and corn up 2-3 cents. The dollar remains weak, against everything but the pound, and crude oil is a little firmer. The US Energy Dept are expected to say that crude stocks rose by around a million barrels last week shortly after the opening of CBOT this afternoon. Yesterday's USDA report is already history. The US weather outlook seems reasonably favourable for attempting to get the remainder of the harvest in. Already attention is starting to turn to South America. In Argentina the western and northern growing areas are very dry, requiring at least 100 millimeters (4 inches) of rainfall to eradicate drought, says Martell Crop Projections. In La Pampa drought is more damaging for winter wheat than soybeans, whilst the best growing conditions exist in Eastern Buenos Aires, Entre Rios, southern Santa Fe and extreme east Cordoba, where field moisture was near normal at the end of October, they add. In Brazil Mato Grosso soybean development looks promising at this early stage of the new growing season, but Parana has become unfavourably dry. Rio Grande so Sul is expecting heavy beneficial rainfall today that would ease dryness, they conclude. I'm starting to be inclined to say that production in South America may not be quite the bin-buster that some are forecasting. The desire to plant and harvest fast maturing early varieties in Brazil to take advantage of front-end premiums may knock a couple of bushels off yields there. There may also be a temptation to cut beans early to get a second corn crop in. In Argentina, yields might be adversely affected by the poor seed quality after last year's disastrous crop, as well as dryness in the north and west. Japan is shopping for 97,000 MT of mostly US wheat this week and Jordan are in the market for 100,000 MT later in the month. The Russian grain harvest now stands at 101.4 MMT in bunker weight, according to the Ag Ministry, of that 63.4 MMT is wheat and 18.7 MMT barley. Early calls for this afternoon's CBOT session: corn called 1 to 3 higher; soybeans called 6 to 8 higher; wheat called 3 to 5 higher. Nogger's favourite grains website Agrimoney.com is reporting that Brazil might be about to scrap it's duty on wheat imported from outside the Mercosul trade bloc. Brazil's regular No 1 wheat supplier is Argentina, who in previous years have normally had enough to meet almost all of Brazil's import needs. Of course things haven't gone according to plan for the Argies in the last two years, with the 2008/09 crop wrecked by drought and this year's plantings the smallest on record in a two fingered salute to the government. So with a wheat crop of only around 7.5 MMT potentially coming out of Argentina this year, and them consuming around 6.5-7.0 MMT themselves, there isn't going to be much left for Brazil's best mates to export this year. Hungry Brazil are set to consume 11.4 MMT of wheat in 2009/10 according to yesterday's USDA figures, but with their own production badly affected by heavy rains they are likely to deficient to the tune of around 7 MMT this year, say Agrimoney. Clearly the vast majority of that is now going to have to come from outside the bloc. Well it's a good job that the shops are still open isn't it? Certainly the US will be fancying their chances of a slice of that action, as Brazilian millers are famously anti-Russian wheat. The pound slipped following the release of the BoE's quarterly inflation report today, which said that inflation is likely to rise sharply in the near term, and that there are big downside risks for the UK economy. Bank of England governor Mervyn King subsequently once again reiterated his opinion that a weak sterling would help the UK economy in terms of improving exports. Crude oil is steady around USD79/barrel this morning, ahead of a US Energy Dept report due at 15.30 GMT that is expected to show crude inventories rose by around a million barrels last week. Hurricane Ida being downgraded as it made landfall, allowed workers to return to their posts in the Gulf of Mexico which also added a bearish touch. On the positive side, a weak dollar continues to support crude. News that China - the world's second largest consumer of oil - imported almost 4.5 million barrels/day in October, it's second largest amount ever, was also seen as supportive. Demand from China is providing a major boost for crude oil, with a slew of supportive data out overnight. Industrial output rose 16.1% in October, and power generation grew at it's fastest in 19 months. December corn futures closed at USD4.09, up 8 ¾ cents. Corn buyers came in about 11:30 to move the market to higher ground into the close. USDA projected corn prices will range between USD3.25 and USD3.85 for the marketing year weighted average price received by farmers. The DTN national average basis for corn widened to 37 cents under the December futures contract today. That would price corn at USD3.57 ½ for a national average at today's prices, which would be slightly above the mid-range of USDA's forecasted price. The weak technical picture of the US dollar makes corn attractive to foreign buyers. USDA reduced the 2009/10 corn production down to 12.921 billion bushels, decreasing the per acre yield to 162.9 bushels from 164.2 last month. Most of the country has minimal rain forecast over the next five days, so harvest should continue except for the south east corner of the US, where hurricane Ida will be dumping significant rain. November soybean futures closeed at USD9.61 ½, down 2 ¾ cents, December soymeal futures at USD288.20, down USD6.10 and December soy oil futures at 37.56, cents, down 21 points. Soybean prices finished lower today. Soybeans had established a USD2.18 trading range in the June/July time frame and the price has remained basically in that range since. Prices for January soybeans are currently priced at USD9.68. The DTN national soybean basis widened 6 cents to 59 cents under the January futures price as harvest continues uninterrupted by weather. USDA is forecasting the marketing year weighted average price received by farmers for 2009/10 to range USD8.20 to USD10.20. Harvest should continue at a good pace over the next several days with 25% of the crop in the field as of Sunday. the USDA raised soybean production to 3.319 billion bushels with average yield of 43.3 bushels to the acre. Brazil soybean production is projected at a record crop of 63 million tons, increasing by one million tons from the October report. December CBOT wheat futures closed at USD5.23, up 3 cents. Wheat finished higher, staging a minor rally after 11:30. USDA reduced US wheat supplies by 4 million bushels decreasing HRS and durum production. Exports were lowered because sales are down as well as shipments. USDA decreased export projections by 25 million bushels to 875 million bushels. US ending stocks, if realized will be at a 10 year high at 885 million bushels. USDA predicts the weighted average price received by farmers for the 2009/10 marketing year to range USD4.65 to USD5.05. The price was reduced by 10 cents on both ends. The report reminded the trade the world has lots of wheat. Global supplies for 2009/10 are projected to increase 1.7 million tons. Sufficient supplies of Black Sea wheat are expected to limit exports for Europe and North America. EU wheat futures ended slightly lower Tuesday with London November feed wheat ending down GBP0.25/tonne at GBP104.85/tonne, and Paris November milling wheat down EUR0.75 at EUR124.75/tonne. As per normal it was another day of apathy, with farmers reluctant sellers and buyers content to sit on their hands. The long-awaited USDA report pegged global wheat production higher at 671.89 MMT, up from 668.12 MMT last month, although that was no great surprise. We are really treading water at the moment until we get a clearer picture of Eu and FSU production later in the year. Output from India and China also warrants keeping an eye on, as there is potential there for some production hiccups later in the year. As ever, there's a lot of chaff to be sifted through, and as so frequently happens it may be that the report is history after the first half hours trading of the day. The bottom line is that there wasn't a lot in the report that we didn't really know already. The US will harvest a record soybean crop in 2009, despite the weather problems, TICK, we knew that. South American production will also likely be a record in 2010 with Brazil producing 63 MMT, TICK, and Argentina 53 MMT, TICK. The USDA will stick it's head in the sand a little while longer yet with regards to Chinese corn production, they've already dropped it 10 MMT, you don't expect them to do the same again surely? TICK. The USDA cocked up back in the summer with a rather low Russian wheat estimate, which they've gradually been clawing back ever since, hoping nobody would notice. TICK. Production in Kazakhstan and Ukraine is also higher than they have been saying. TICK. US export potential has been overstated, TICK. US soybean production seen at 3.319 billion bushels, with an average yield of 43.3 bu/acre. that's above the average trade expectation of 3.269 billion bu and 42.7 bu/acre. Interestingly all the big leading "faces" like Allendale, Informa and FC Stone were in that kind of ballpark, with Informa and FCS actually a little higher than these numbers, so they might not be quite as bearish as at first glance. Corn, conversely, came in a little below expectations at 12.921 billion bushels and a yield of 162.9 bu/acre. Pre-report estimates were for 12.995 billion and 163.7 bu/acre. All the leading faces were estimating in excess of 13 billion, so I guess you could call the corn numbers slightly bullish. Both corn and beans are still record crops. Elsewhere the USDA raised global soybean production by 4 MMT to 250.23 MMT, increases came from the US of 2 MMT, Brazil 1 MMT (to 63 MMT) and Argentina by 0.5 MMT to 53 MMT. The world wheat crop was raised from 668.12 MMT to 671.89 MMT, with Canadian production only dropped 0.5 MMT to 24 MMT. Russian output was increased 2 MMT to 59 MMT, Kazakh output by 2 MMT to 17 MMT and Ukraine was upped a half million to 20.5 MMT. Early calls from CBOT floor are corn up 2-4 cents, beans dn 5-10 cents. An interesting article on the first4farming website today here, suggests that there might be some interesting repercussions to fund money creeping back into the wheat market. 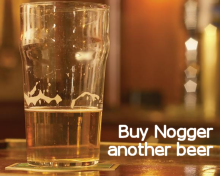 With all the ongoing hullabaloo concerning stricter regulation of the Chicago market, making it more difficult for the funds to operate, might they take their business elsewhere? They're hardly likely to find the kind of very low volumes that have been trading on London wheat recently attractive, that's for sure. Blimey, if they have a problem in the US with lack of convergence, imagine what that would do for the market here. The pound fell in early trade Tuesday, after Fitch Ratings said that the UK was the most likely of the leading G10 nations to lose it's AAA sovereign credit rating. As QE increases, the swelling budget deficit which is expected to average over 12% this year and next, means that the UK requires “the largest budget adjustment” of the countries it ranks AAA, said Fitch. Another significant stimulus package would put the UK's rating at risk, they said. September's budget deficit was the largest for that month since records began, up 70% on a year ago to GBP14.8 billion. November soybean futures closed at $9.64 ¼, up 16 ¼ cents, December soymeal futures closed at USD294.30, up USD5.50, December soy oil futures closed at 37.77 cents, up 53 points. A new 15-month low in the US dollar index lent a supportive tone to the soy complex, as too did gains in crude oil and gold setting fresh all-time highs. There was also an element of fund money, which was missing from Friday's trade, back in the marketplace today. After the close, the USDA reported the soybean harvest at 75% complete, bang on expectations but well behind 92% normally. December wheat futures settled sharply higher at USD5.20, up 22 ¾ cents. Spillover strength from the other grain helped wheat today, as did a variety of outside market influences. Short-covering ahead of tomorrow's USDA report may also have been a positive factor, although no major surprises are anticipated. After the close the USDA said that winter wheat plantings in the US are 86% done, a little behind schedule. SRW seedings are of most concern in Illinois (63% vs 96% normally), Indiana (73% vs 96%) and Missouri (38% vs 80%). EU wheat futures closed mixed Monday with London November feed wheat up GBP1.10/tonne at GBP105.10/tonne and Paris November milling wheat down EUR1.25 at EUR125.50/tonne. There wasn't a lot of fresh news to start the week. German analysts FO Licht pegged global wheat production at 666.69 MT, in line with other estimates from the USDA and IGC. A sharply weaker US dollar was a negative factor today, although there might have been some nervousness ahead of tomorrow's USDA crop production report. We still have a stand-off between reluctant sellers and comfortable buyers. Outside markets were supportive, with gold hitting fresh all-time highs, and stocks also posting gains. The Argentine harvest is just about underway at around 7% done, whilst in Australia an estimated 25% of the wheat crop has been cut. 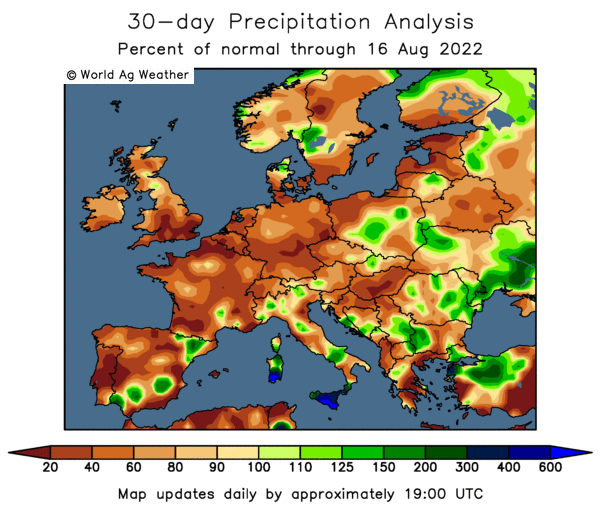 In Eastern Europe early reports suggest that winter wheat sowing has been reduced due to a combination of dryness and lack of credit. Current low prices have also discouraged some planting it seems. In Ukraine exports continue to run at a record pace, despite a sharp 20% fall in production this year, with 9.5 MMT of grain (5.1 MMT of it wheat) exported as of last Friday. The overnight's closed firmer on the back of a sharply weaker dollar. Beans and wheat finished around 7-8 cents higher, with corn up 4-5 cents. Dry weather and above normal temperatures over the weekend will have sparked a surge in harvest activity, particularly with Hurricane Ida due to hit land tomorrow, bringing another round of soaking rains for the Delta. The USDA are out tonight with their harvest progress and wheat planting progress report. Last Sunday the US soybean harvest was 51% done, and the corn harvest 25% complete, analysts expect that tonight those will have increased to around 75% and 35-40% respectively. The Indian government might release 3 MMT of wheat onto the domestic market, according to media gossip. Is that the same 3 MMT that they were going to release two months ago we ask ourselves? Jordan are tendering for 100,000 MT of wheat and Taiwan will seek 64,700 MT of US wheat on Wednesday. The wheat harvest Down Under is progressing, although domestic prices are very depressed due to a strong Australian dollar. The US dollar meanwhile is sharply weaker, although off earlier lows, which has caused crude oil to retreat from this mornings highs. Early calls for this afternoon's CBOT session: corn called 3 to 5 higher; soybeans called 7 to 10 higher; wheat called 6 to 8 higher. I think that we might see session highs set early in the day, unless some serious fund buying kicks in. The Telegraph lifts the lid another food labelling scandal, revealing that the pork in Wall's Lincolnshire or Cumberland sausages has as much chance of being German as British. Wall's said that the words Lincolnshire or Cumberland refer to the recipes used, not where the meat is from. Although it doesn't spell that on the packet for the uneducated masses does it? Last week the Telegraph revealed that Pret a Manger chicken sarnies containing "only fresh, natural ingredients" were made with frozen chicken from Brazil. The week before that Pret's “spankingly fresh” fish came frozen from 7,000 miles away. It was fresh when it was caught, then it was spanked and frozen, and then shipped thousands of miles to the UK where it was unfrozen and spanked again, just for good measure, we assume? Carr's Milling Industries plc have announces its results for the 52 weeks to 29 August 2009 today. In agriculture, divisional revenue was 8% lower at £255.0m (2008: £275.8m) and operating profit (before retirement benefit charge but after non-recurring items and amortisation) decreased by 48% to £6.0m (2008: £11.7m). In food, operating profit (before retirement benefit charge but after non-recurring items and amortisation) of £2.3m (2008: £2.0m), up 19%, was achieved on revenue 8% lower at £79.0m (2008: £85.6m). The decline in revenue reflected the lower price of the principal raw material, milling wheat, which was passed on to the customer, they said. The operating margin, though improved, remained modest, at 3.0% (2008: 2.3%). In the year, all three of the Group's flour mills - at Kirkcaldy (Fife), Silloth (Cumbria) and Maldon (Essex) - made volume gains through product innovation and increased their profit through cost reduction, they added. The pound is up to it's highest level against the dollar since early August this morning, breaking through USD1.68 on a feeling that all the bad news might finally be out of the way. There seems to be a general belief that last week's extra GBP25 billion of QE might be the last lot of good money to be thrown after bad. There is also a delayed reaction weakness about the dollar, after Friday's news that non-farm payrolls rose more than expected, pushing unemployment up to 10.2%. The weekend meeting of G20 muppets appeared not to address the issue of a weak dollar, encouraging further shorting of the greenback this morning. Another bullish factor being cited for the pound today is the hostile GBP10 billion bid allegedly being lined up by Kraft for the nation's favourite chocolate manufacturer. The overnight grains are higher on dollar weakness in early trade this morning. Beans up around 12 cents, corn up 4-5 cents and wheat 6-7 cents firmer. It should have been a busy harvest weekend for many across large parts of the US Midwest, although the delta and the east are set for another soaking starting tomorrow as the remains of hurricane Ida move inland. A belt of rains of 5-6 inches are expected to move northwards on a line roughly from New Orleans to New York Tuesday through to Thursday. The USDA will report tonight on harvest progress (and wheat plantings) and tomorrow on crop production. Tomorrow's report is expected to show corn production at 12.940 billion bushels, and soybeans at 3.262 billion bushels, according to Reuters. That's down a little on corn from last month's 13.018 billion bushels, and up a little on soybeans from 3.250 billion bushels in October. Some analysts, like Informa, also have corn output coming in a bit higher than last month too (13.064 billion bushels). The dollar seems to be suffering a delayed reaction to Friday's unemployment numbers. as the dollar falls, crude rises, up USD1.25 to USD78.68/barrel. Today's upswing may also be a partial correction from Friday's losses. Most of the newswires report the absence of fund money on Friday, allowing the bears to easily press prices lower. In eastern Australia the harvest is said to be about 25% done. A strong Ozzie dollar means growers are reluctant sellers, with feed barley only worth A$100/tonne (that's GBP55/tonne) who can blame them? The Philippines are tendering for 600,000 MT of rice, whilst the Indian's continue to prevaricate. Jordan are tendering for 100,000 MT of wheat.